Inn Credible Caterers announces new event and wedding facility in Cold Spring New York. Inn Credible Caterers proudly announces its new picturesque event and wedding venue on the Hudson River – Chalet on the Hudson. With views of Storm King Mountain and the famous Breakneck Ridge, this Putnam / Westchester County area banquet hall nestled on the banks of the Hudson River offers an amazing backdrop to any affair. To compliment the surrounding natural beauty, the facility is currently undergoing renovations to its ballroom and outdoor space, which are set to be complete this year. "The Hudson Valley is a breathtaking region, making it the perfect event and wedding site. We selected Chalet on the Hudson as one of our facilities because its spectacular views set the stage for a grand celebration and provide for fabulous photo opportunities," said Frank DeBari of Inn Credible Caterers and owner of Chalet on the Hudson. "We are currently remodeling to make Chalet even more inviting – new crystal chandeliers, window treatments and paint design; accent up-lighting in the ballroom; and an enveloping outdoor ceremony garden. 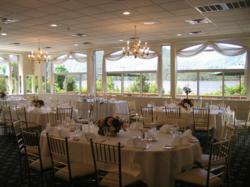 The setting, combined with renowned Inn Credible Caterers cuisine and service, creates an affair to remember." Chalet is a quaint and intimate facility, which only holds one affair at a time. It offers creative menus, a personal event planner, and low minimum guarantees. One of its unique offerings is its A La Carte Wedding, which lets you create your very own wedding package and price – each drink and menu option is separately priced rather than rolled into a package allowing you to select something that best meets your tastes and budget. Inn Credible Caterers has been providing catering services throughout the Hudson Valley for over 20 years, specializing in. In addition to Chalet on the Hudson, the company operates The Clubhouse at Patriot Hills in Stony Point, New York. For more information about Chalet on the Hudson located at 3250 Route 9D, Cold Spring, New York, visit http://www.chaletonthehudson.com or call 845-265-2600. For more information contact Bonnie at 845.265-2600.